Gem, amethyst (natural), light to medium, 12x8mm faceted pear, A grade, Mohs hardness 7. Sold individually. Item Number: H20-1696FG Have a question about this item? The stone of sincerity. 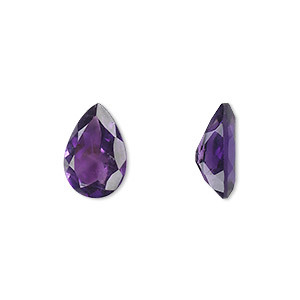 A-grade amethyst is a beautiful shade of light to medium purple with no black. 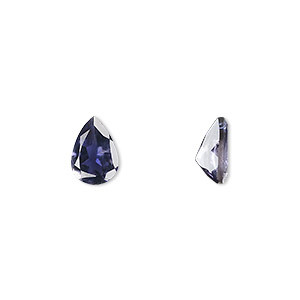 This grade is suitable for your finest faceted gemstone jewelry. Most material comes from Africa. 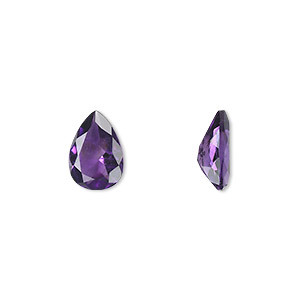 Gem, amethyst (natural), light to medium, 8x5mm faceted pear, A grade, Mohs hardness 7. Sold individually. 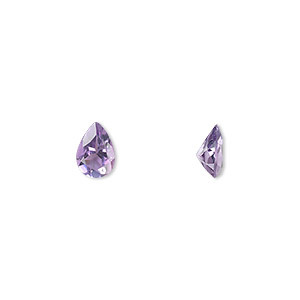 Gem, amethyst (natural), light to medium, 9x6mm faceted pear, A grade, Mohs hardness 7. Sold individually. Gem, amethyst (natural), light to medium, 10x7mm faceted pear, A grade, Mohs hardness 7. Sold individually. Gem, amethyst (natural), light to medium, 6x4mm faceted pear, A grade, Mohs hardness 7. Sold per pkg of 2. Gem, amethyst (natural), light to medium, 5x3mm faceted pear, A grade, Mohs hardness 7. Sold per pkg of 4. Gem, iolite (natural), 10x7mm faceted pear, A grade, Mohs hardness 7 to 7-1/2. Sold individually. Gem, iolite (natural), 6x4mm faceted pear, A grade, Mohs hardness 7 to 7-1/2. Sold individually. Gem, iolite (natural), 9x6mm faceted pear, A grade, Mohs hardness 7 to 7-1/2. Sold individually.